Flash My Brain - Print flash cards for use on trains, in study halls, or under trees. 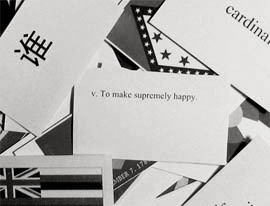 Print flash cards for use on trains, in study halls, or under trees. Flash My Brain can print out your card stack on professional-quality cardstock. 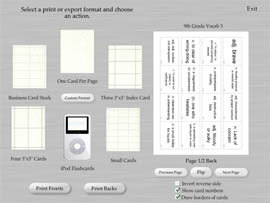 Perforated card stock available at OfficeMax and Staples can be used to print business card sized or index card flashcards. 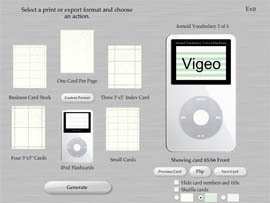 If it's not one of the ready-made templates, Flash My Brain's custom layout feature can adjust to virtually any format. Flash My Brain has several ready-made templates built in. 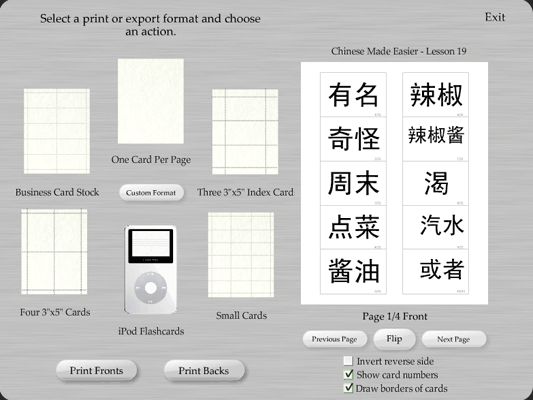 From giant flash cards for use in front of the class to mini-flashcards that can be stashed anywhere, Flash My Brain offers can print out the flashcards you need. Or how about iPod flashcards? Buy Flash My Brain for $39.95 to start printing, making, and studying flash cards the Flash My Brain way. As you can see, print output from Flash My Brain is excellent and completely usable. The natural interface of Flash My Brain makes bringing your cards into the real world simple and satisfying.